The Runcible is both the strangest and most intriguing device that I've seen at Mobile World Congress this year. It offers many of the same capabilities as a smartphone, but it looks like a trinket you would find in a trendy vintage store. That's by design, though: Its creator, Monohm, wants the circular gizmo to challenge the now ubiquitous smartphone experience, which is increasingly defined by a relentless stream of notifications. Aubrey Anderson, the company's founder and CEO, describes the Runcible as a "quieter" gadget that can help people relax and live in the moment, while still staying connected online. So what does it do? Well, the Runcible tries to solve the problem of internet overload. Smartwatches, Google Glass and other wearables all promise to make notifications more manageable, with glanceable information that can save you from constantly pulling out your smartphone. 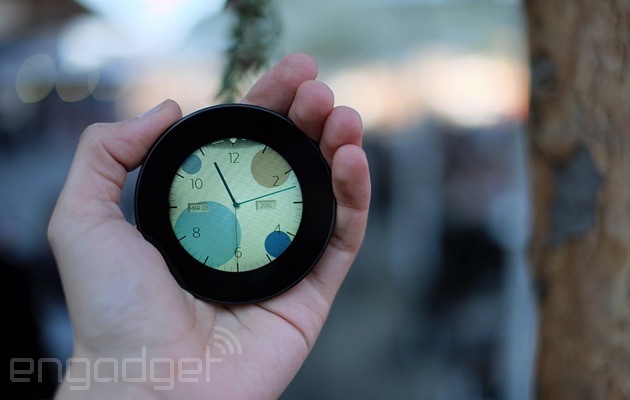 The difference with the Runcible is that it's a truly standalone device. It runs on Mozilla's Firefox OS platform and lets you make calls, ask for directions and browse the web. So when you're heading out to grab dinner with friends, you can leave your smartphone at home and avoid the temptations of Facebook, Twitter and Snapchat. Three people at Monohm have been building the Runcible for the last 10 months, so the software is still in early development. Anderson is cautious to talk about too many individual apps, or "faces," as he calls them, but the prototype indicates where the team is headed. One watch face has different colored bubbles that increase in size as your social networks become more active. Another apes a classic compass, giving just a single direction and the remaining distance to your destination. They're not as complex or informative as a smartphone app, but that's the sort of whimsical experience Monohm is shooting for. It's also why the "anti-smartphone" is such an unorthodox shape. The company wanted a quiet, relaxing product and took inspiration from pocket watches, compasses and other circular objects that people used to carry in their pockets. It culminated in the prototype now being shown off in Barcelona, which has a flat, circular display on one side and a softly curved piece of wood on its rear. "As we did the industrial design, the form became a symbol for the idea and the product itself," Anderson says. "Just to hold it is calming." The Runcible is supposed to represent a new product category that sits somewhere between a wearable and a smartphone. It's small enough to slip in a pocket, but also boasts all of the connectivity of a modern handset, including LTE, WiFi, Bluetooth and NFC. Like a traditional pocket watch, Monohm hopes people will hold on to the Runcible and pass it down as an "electronic heirloom." Technology moves fast, so its innards have been designed to make it easily fixable and upgradeable. It's not quite Project Ara, but Anderson hopes it will keep the Runcible current and useful for years to come. "Just because the camera resolution falls out of spec with whatever is current, we don't want you to have to throw out the whole thing," he says. "We just want to be able to replace the camera." The Runcible is a strange product, but it's hard not to admire Monohm's audacity. It's a radically different take on the smartphone, which is refreshing in a market chock-full of thin, flat handsets made from metal and glass. The company also has financial backing from Japanese carrier KDDI; the Runcible is almost definitely coming to Japan, and won't evaporate like so many Kickstarter and Indiegogo projects. It'll be a difficult gadget to market, but at least Monohm won't have any problems standing out from the crowd.